The information presented on this page was originally released on June 28, 2013. It may not be outdated, but please search our site for more current information. If you plan to quote or reference this information in a publication, please check with the Extension specialist or author before proceeding. MISSISSIPPI STATE – Mississippians love Fourth of July watermelons, and the 2013 melon crop should be worth the wait after weather delays. 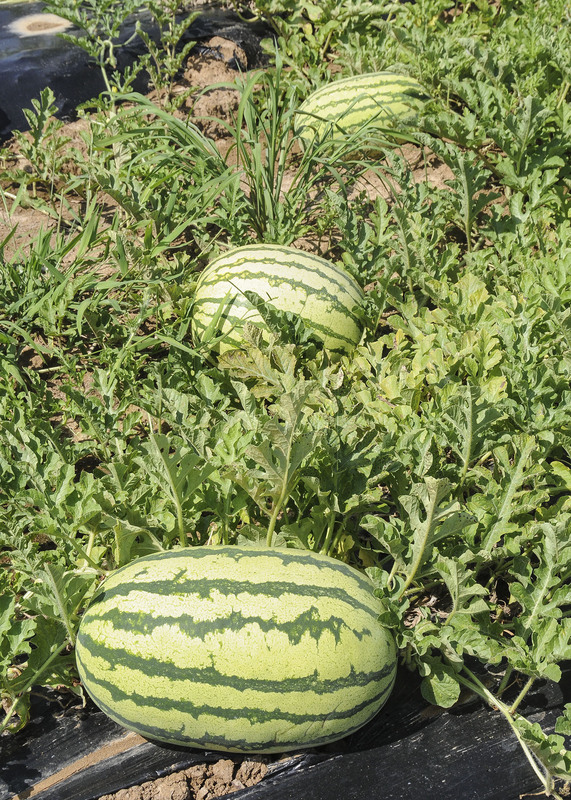 David Nagel, horticulturist with the Mississippi State University Extension Service, said the biggest challenge has been the slow growth rate that caused some concern that the first melons might miss the holiday celebrations. The good news is that clear, sunny days with plenty of rain along the way have combined to produce large, tasty melons. Nagel said the state’s commercial acreage has not changed much in recent years, but small plots grown for local farmers markets and roadside stands are becoming more common. “As consumers seek locally grown produce, farmers are attempting to meet those demands with a variety of crops, and watermelons are a favorite,” he said. Nagel noted that the state’s growers and consumers are slowly embracing seedless varieties. Nagel said the 2013 crop did not encounter any unusual insect or disease pressure. “Most growers use a preventive fungicide regime because they know diseases will attack without it,” he said. Allen Eubanks of Eubanks Produce in Lucedale said he had to replant about 200 acres early, but then heavy rains caused further damage that delayed early growth. “We finally got good weather but are on average about two weeks behind schedule. Normally, we start harvesting around June 10,” he said. Eubanks primarily sells his watermelons to retail stores across the Southeast. He said prices vary based on the seed variety. “Prices on seeded watermelons are running below average, and prices on seedless varieties are better than average,” he said. James Earnest of Prospect Produce Farm in Chickasaw County said he will be lucky to harvest ripe watermelons by July 4. “The cool temperatures and light frost knocked them back and delayed early growth. At the same time, we lost about half of our early blackberries because of the conditions that caused pollination problems,” he said. Mississippians’ love of watermelons has made this large vegetable the focus of several special events throughout the summer. One of the first is the Farm Bureau Watermelon Classic on July 4, which includes a 7:30 a.m. 5K run/walk at the Mississippi Sports Hall of Fame and Museum in Jackson. Two cities host events spotlighting this summer icon. Smith County is home to a watermelon festival July 19-20 in the Mize City Park. Water Valley in Yalobusha County will host the 44th annual Watermelon Carnival Aug. 2-3.